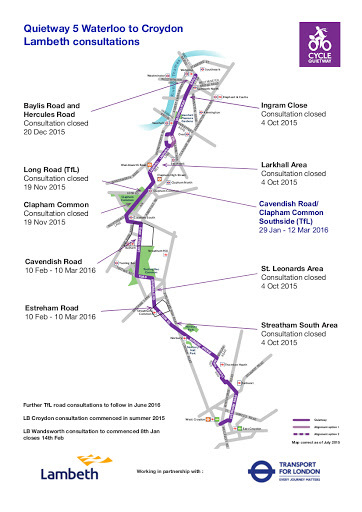 Transport for London and Lambeth have published details of proposals to make Cavendish Road, in Balham, and Estreham Road, in Streatham, more cycle friendly as part of the Quietway 5. The TfL Quietways will offer a network of less-busy cycle friendly road routes linking key destinations across London. Quietway 5 (see map) will run from Waterloo to Croydon and is due to be built in summer 2016. This is the latest section of the route to go out for consultation. The proposals are outlined below. Local residents and cyclists are encouraged to respond to the consultation on the TfL consultations website - the closing date is 17 March 2016. Lambeth Cyclists will be responding to the consultation: we will discuss our response at our February meeting. Install raised tables at the junction of Cavendish Road and Cathles Road and the junction of Cavendish Road and Kenilford Road. Introduce cycle friendly speeds humps along the length of Cavendish Road. Build out footways at the junction of Cavendish Road/Old Devonshire Road and Cavendish Road/Weir Road. Raised junction entry treatment at Old Devonshire Road. Trial to restrict access to Estreham Road for northbound motor traffic at the existing zebra crossing outside Streatham Common Station. The six month trial to restrict access is designed to allow motor vehicle access to the train station, but reduce the volume and speed of motor traffic on Estreham Road. A traffic island and tree is proposed to be installed. Estreham Road is currently used as a ‘rat-run’, with non-local motor traffic using this road to avoid the traffic signals at the junction of Greyhound Lane and Streatham High Road. Southbound motorists would still be able to access the road here as they currently do.